Land-based sports include golf, tennis, and biking (a major sport as evidenced by the 10 day Tour de la Guadeloupe international race held on the island each August). Hikers will find challenges on trails of varying length and difficulty in the Parc Nationals spectacular rain forest, climbing La Soufrière volcano, or exploring the Caribbeans highest waterfalls , Les Chutes du Carbet. Horseback riding is offered at a number of different locations on the island. Off-road exploration by quatre-quatre (4x4) vehicle is also available, primarily on Basse-Terre. Please click here for a directory of land sports resources. For swimming and snorkeling, nature can change the coastline, so it's a good idea to ask locally for the current best places to go. Snorkeling equipment is available at most hotels. Glass-bottom boats at Malendure Beach offer snorkeling trips to Pigeon Island. The best surfing spots are along the north shore of Grande-Terre at Le Moule, Port Louis and Anse Bertrand; the best months are October and April. In the summer, Ste. Anne, St. François and Petit-Havre occasionally have good waves. Boards generally rent on either a daily or weekly basis and are available in Le Moule and St. François. For scuba divers, the most popular spot is Pigeon Island off Guadeloupe's west coast, which Jacques Cousteau called "one of the world's 10 best" diving areas. On or near Malendure beach, facing Pigeon Island, several schools have licensed instructors. Dives are also available from the Gosier area and from the small island of Terre-de-Haut off the southern coast of Basse-Terre. All dive operations are supervised by monitors who have French Government certification. They offer a variety of programs, from initiation to one-day and week-long courses. Dive operators are located in the Malendure/Bouillante/Pigeon area, Pointe Noire, Deshaies, Port Louis and Sainte-Rose on Basse-Terre. Although the west and north coasts of Basse-Terre are the most popular dive areas, scuba is also available through dive operators in Gosier, Sainte-Anne and St. François on Grande-Terre. Windsurfing is so popular a sport that prestigious, international windsurfing events are held on the island, including "Ronde du Rhum" and the "Funboard World Cup. Lessons and rentals are available at most beachfront hotels. Water skiing is available in 15-minute increments per outing, with facilities at the beachfront hotels in Gosier as well as at Baie Mahault. Motorboats can be rented on an hourly basis. 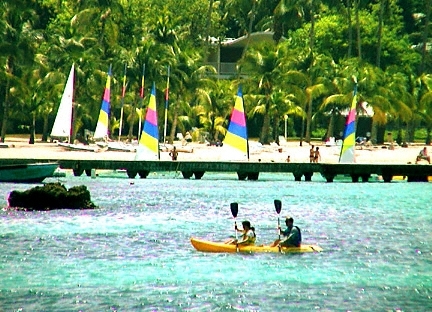 Canoeing and kayaking are available in the resort areas of Gosier, Bas-du-Fort and St. François as well as in Sainte- Rose and Petit-Bourg. Jet skiers will find rentals available in Gosier, St. François and Sainte-Anne. Sunfish, Hobie Cats and pedalboats are available at many beachfront hotels, usually at an hourly rental rate. Please click here for a directory of water sports resources.